Dan's craftsmanship shows up in each cabin and guests enjoy gazing around the cabin studying the details. The logs were harvested nearby the homestead and milled by Dan on his sawmill, then artfully crafted into the cozy cabins. The furnishings and décor show Sandy's thoughtful attention to detail and the beauty found in nature. Cheery flower baskets and flower beds are plentiful around each cabin, and comfy lawn chairs on the deck invite you to sit a spell and relax. Everything is provided that you might need for your stay: dishes, pots & pans, bedding, linens, bathroom shower supplies, hair dryer, and the kitchen includes refrigerator, stove / oven, microwave, toaster, and coffee maker with complimentary coffee / condiments. 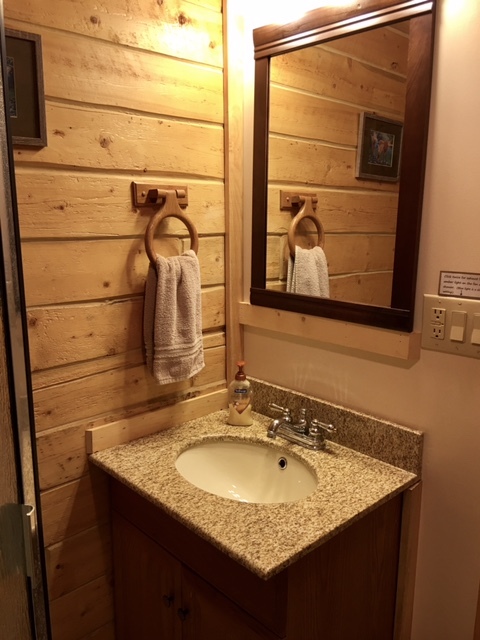 The Woodland Trail Cabin has a washer / dryer for your convenience. Heat is provided by an energy efficient oil stove that is easily adjusted for your personal comfort level. Each cabin has a TV with DVD player and a small selection of family friendly movies, and there is wireless internet in each cabin. There is an inviting deck on each cabin with deck chairs / small table – perfect for sipping a glass of wine on a quiet evening or enjoying your first cup of coffee in the morning sunshine. You will also find a barbecue grill, fire pit, and picnic table for your use at each cabin. The cabins are nestled in the woods with ample parking by your front door. Each one is private with the adjacent ones a short stroll away, and a short jaunt from your host's log home. There are some great hiking trails leaving almost from your front door and your hosts can also suggest more challenging trails in the Glacier View area. There are some resident moose with calves and if you are lucky, you may have some visitors wandering through so keep your eyes peeled and camera ready! 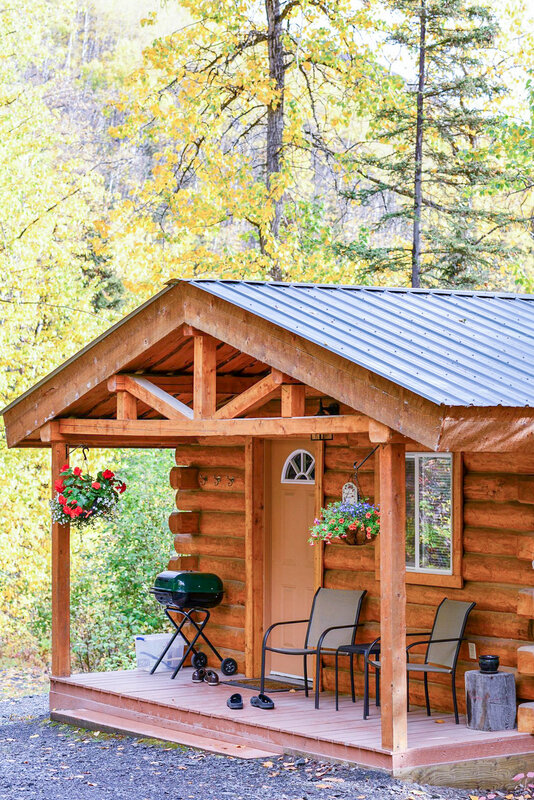 This cabin is our smallest and built from cottonwood logs. 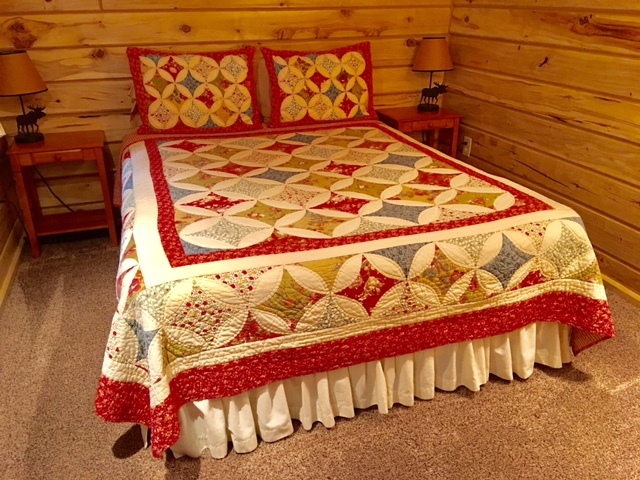 It is furnished with a cheery red handmade quilt on the queen sized bed in the adjoining bedroom, set off by a beautiful arched doorway in the logs. A cozy living room invites you to put your feet up and relax while enjoying your surroundings. 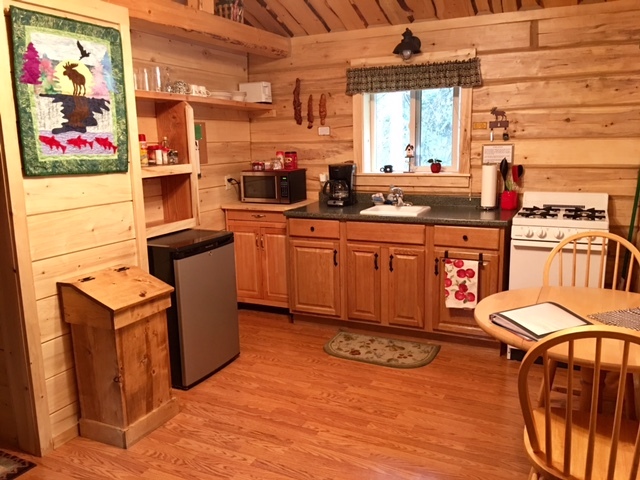 The compact kitchen contains everything you need including a refrigerator, stove with oven, microwave, coffeemaker, toaster, and complimentary coffee and tea. Alaskan artwork makes this cabin a favorite with our guests. Accommodates 1-­2 people. 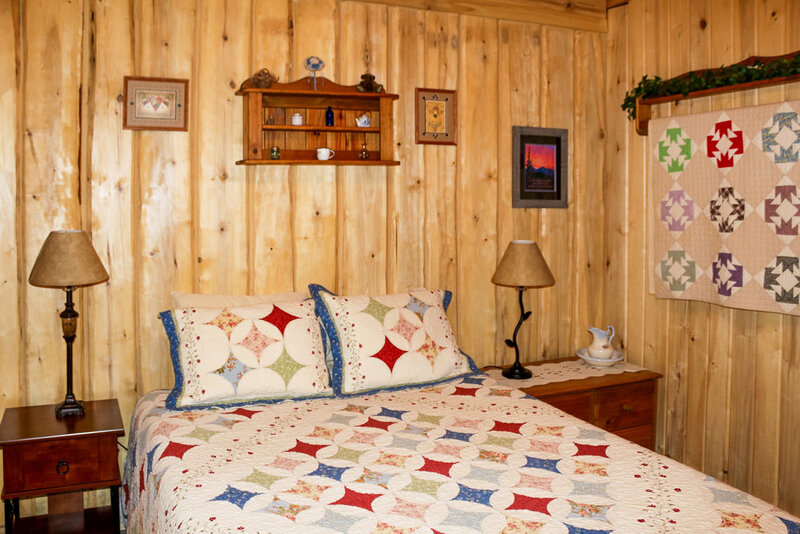 This is our mid­size cabin with 2 separate bedrooms (queen bed in one and a double bed in the other), handcrafted with white spruce logs which were milled on our family sawmill. There is a private bathroom with a shower, and a full kitchen which contains everything you need to whip up a complete meal. The country quilts and beautiful décor lend a welcoming atmosphere, and there's no better place to have your morning coffee but on the private deck in the bright morning sunshine. Free wireless internet in the cabin. Accommodates up to 4 people. This is our largest cabin with 2 bedrooms, constructed of unique vertical logs and has beautiful woodwork throughout the cabin. It has a larger more complete kitchen and a comfortable living room with a reclining loveseat and 2 rocking chairs. There is a queen size bed in one bedroom, with double and twin sized beds in the second bedroom along with the availability of a twin sized roll­away. The large private bathroom with shower also contains a washing machine and dryer. Free wireless internet in the cabin. Accommodates up to 6 people. Weekly Rate: Stay 6 consecutive nights, get the 7th night free. Winter Rate: October 1 through April 30. Minimum 2 night stay in all cabins during the Winter months. Rates are based on double occupancy; add $10 for each additional person. Add 5% Mat-Su Borough bed tax to all rates. You can make a reservation yourself by clicking the button below, or call us for questions at (907) 745-4514 from 9 am to 9 pm. 50% deposit required at time of booking, excluding tax. Remaining balance due on day of arrival. We accept Visa and MasterCard for the deposit, and Visa, MasterCard, or cash for the balance when you arrive. We will automatically charge your credit card on the day of your arrival — or if you notify us in advance, you can pay with a different credit card or cash when you arrive. Cancellations up to a month before arrival will have their deposit refunded less a $25 service charge. Cancellations 1-3 weeks before arrival will forfeit their deposit. Cancellations 1 week (7 days) prior to arrival or No Shows will be charged the full amount of their reservation. Reservations are usually made well in advance of the short busy summer season but if the cabin is able to be rebooked on short notice, a refund will be applied to the credit card on file. Making a reservation implies agreement with cancellation policy. Check in is between 4:00 and 9:00 pm; if you will be later than 9:00 pm, please call ahead at 907-745-4514 for alternate instructions for your arrival. Please check with us if you need to make other arrangements. No smoking or pets allowed in the cabins.